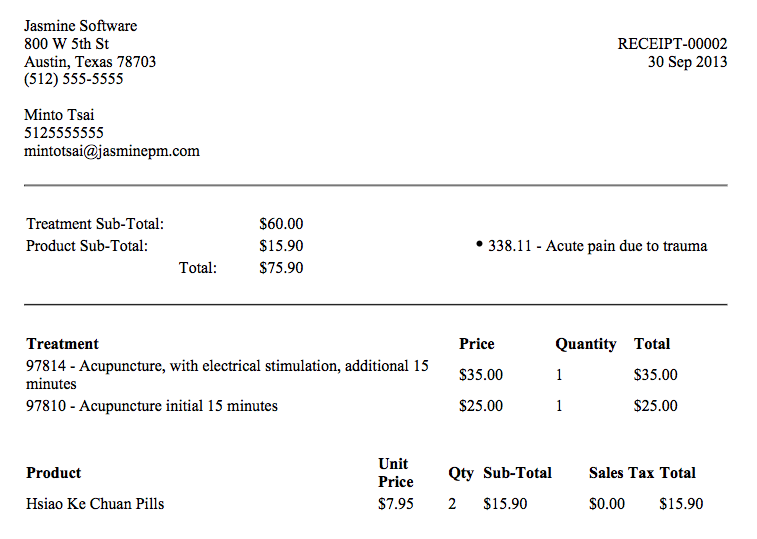 Tools to Grow Your Acupuncture Practice | Jasmine Software: New Superbill to the Rescue! We're very excited to announce that we've added the ability for practitioners to easily generate a Superbill for their patients from within Jasmine Practice Management. Since the Superbill is electronically generated, it will allow practitioners to email and/or print the Superbill to be given to the patient. See Figure 1. below for an example of a Jasmine Practice Management Subperbill. A Superbill is an itemized receipt used by healthcare providers to reflect rendered services. 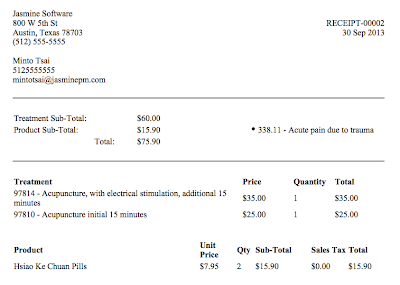 As a healthcare professional, acupuncturists play in the current dominant health payment system which is insurance. We are committed to having Jasmine Practice Managements provide ethical billing, coding and reimbursement for the Acupuncture profession. And one of the ways that patients are reimbursed for treatment by insurance companies is to provide a Superbill for treatment rendered. The Superbill consists of 4 main parts. The Superbill should contain the name, address and phone number of the healthcare provider. The Superbill should contain the patient name and contact information. The Superbill should also contain the visit information such as the date of service, Procedure Codes (CPT) and Diagnosis Codes (ICD-9). The Superbill can also contain additional notes and comments. What else does Jasmine Practice Management provide? In addition to providing the generated Superbill, Jasmine Practice Management also provides additional benefits. Since Superbills are attached to a Patient record, as a healthcare provider, you keep a history of generated Superbills. You are also able to reprint Superbills with ease, if your patient should ask for another copy. As a practice, you can now run reports on all your Superbills and gain better insight into your patient population and why people are coming to see you.